Wandering around the Manor By The Lake grounds, it’s hard to decipher why you wouldn’t want an outdoor wedding. The stunning gardens offers multiple areas for weddings and the grandeur of the Manor House offers the most incredible backdrop. There are three main outdoor areas for your wedding ceremony at Manor By The Lake, each holding their own unique features. You will find two licenced areas including The Pavilion and The Arches. The Pavilion runs just alongside the lake, giving you all the peace and tranquility of its water features and greenery. Here you can hold your ceremony under the ornate bandstand with your guests lining the aisle. Another licenced area incorporates the elaborate architecture of the Manor House, with a ceremony under the Four Arches. This area also offers some protection from the weather. Giving you shade if it’s a hot day or protection from light wind and rain. If you are happy to get your marriage made official on another day, a ceremony in the Italian Gardens would be perfect. These impeccably manicured gardens are updated throughout the year giving you all the beautiful colours of the seasons. Such an idyllic way to incorporate seasonal colours into your wedding photos. Once the ceremony is over, you are free to wander the grounds, giving you the opportunity to have your group shots in various areas in the gardens. A popular photographic moment includes the bridge over the lake. Perfect for a quiet moment for you and your new spouse. Another popular area for photography is on Yew Tree Walk. 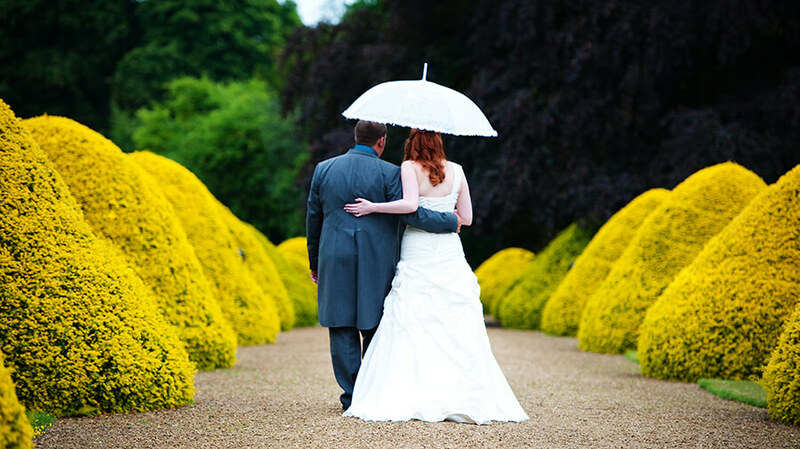 Lined spectacularly by our domed yew trees and surrounded by our beautifully manicured lawn. You can have shots from the balcony, or looking towards the Manor. Outdoor weddings at the Manor give you room to breathe and provides more space to relax. Being outdoors in the fresh air is more family friendly as the children don’t feel as confined. Parents can relax more as noises from the little ones don’t carry as far and it gives an all round more enjoyable experience. Everyone feels happier when they are out and about surrounded by nature and the natural lighting lends itself to showing off your better side. Throughout the day the natural light changes, providing a shift in ambiance as you go from sun rise to sunset. 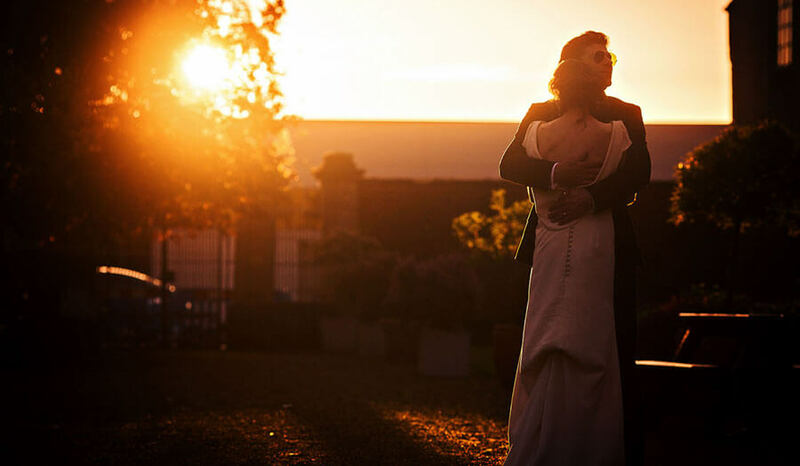 Some may prefer the brightness of the early afternoon sun, perfect for a lighter/brighter wedding. This can then lead on to a late afternoon wedding breakfast. Holding your ceremony later in the day can provide a more calming atmosphere. Such a gorgeous time for photos and can be a little cooler for those in suits during the summer months. Dusk weddings are incredibly romantic, complete with sunset and twinkle lights, the possibilities are endless. The beauty of an outdoor wedding also lends itself to spending less on décor. You can add your own personal touches to the chairs and aisle, but other than that your wedding decoration is provided by Mother Nature. As, it is the UK and the weather doesn’t always behave, outdoor weddings can be moved indoors last minute. The grounds are exclusively there just for you, so you have the freedom to move your wedding to suit the weather. Talk to our team about your creative ideas with an outdoor wedding at Manor By The Lake by calling on 01242 245 071 or via email on weddings@manorbythelake.co.uk.